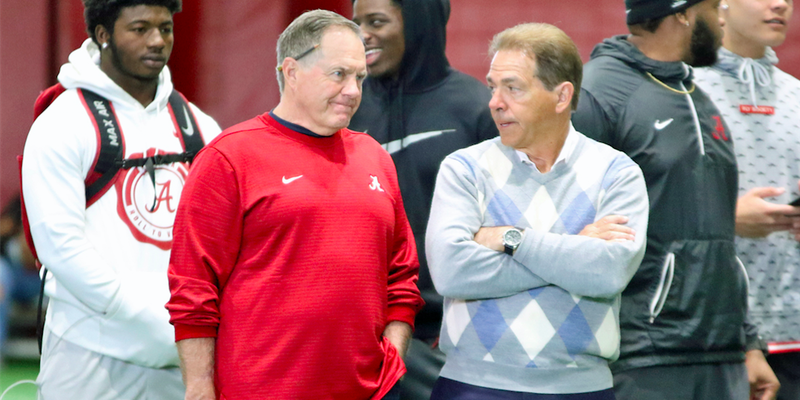 At Alabama's Pro Day on Tuesday, both Bill Belichick and Nick Saban were pictured (above) talking to each other. Theres nothing odd about that, except the fact that Belichick was wearing an Alabama shirt. Saban was later asked about his conversation with Belichick. "We're personal friends, so we talked about kids and grandkids," Saban said, via Alex Byington of the Montgomery Advisor. "We talked about personnel, because they're interested in guys that they bring to their team. And then we're both still very involved in the football part of what's going on, so we'll talk quite a bit about X's and O's." 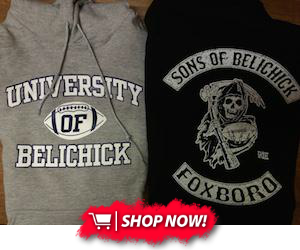 Saban later said that he didn't give Belichick the pullover, but he was glad that Bill got it. Belichick has been a regular at the Alabama Pro Day since 2007, which coincidentally is when Saban took over as head coach at Alabama. But who would blame him? Who wouldn't want a player from Alabama? A college football team that resembles the Patriots in every single way. Lastly I have a question for you, what outfit is funnier to you? Belichick wearing a college football teams shirt at their own Pro Day, or Saban's argyle sweater?